This version of the See All Open Sight has a TRIANGLE reticle. 30 Day Money Back Guarantee - If you don't like it, return it to us within 30 days for a full refund. The See All Open Sight is a pretty cool concept. 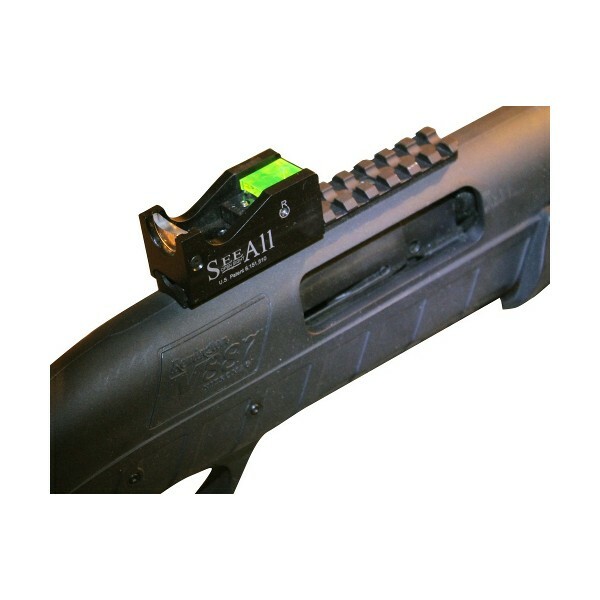 Unlike most open sight systems utilized on rifles (or scopes, for that matter), this sight does not have an exit pupil or eye relief requirement. This means that target acquisition is fast, easy, and simple. The concept is not a new one. 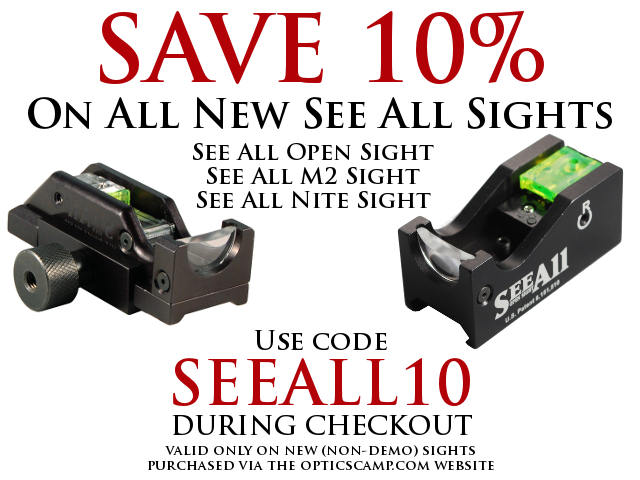 In fact, if you've ever used a red dot or reflex sight, you will feel right at home using the See All Open Sight. Simply bring your rifle or pistol into firing position, and as soon as you see the reticle, aim and fire. Regardless of eye relief or where the reticle appears in the sight picture, that is where your projectile is going to impact. There's a reason why armed forces and discriminating brush hunters use sights like this - they do exactly what they are supposed to do, every time, faster than a scope or iron sights. 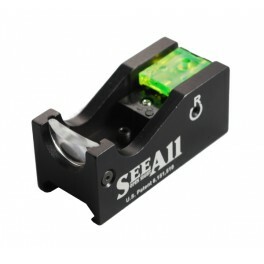 The See All Open Sight is constructed with what looks like only five pieces, excluding mounting and adjustment screws. 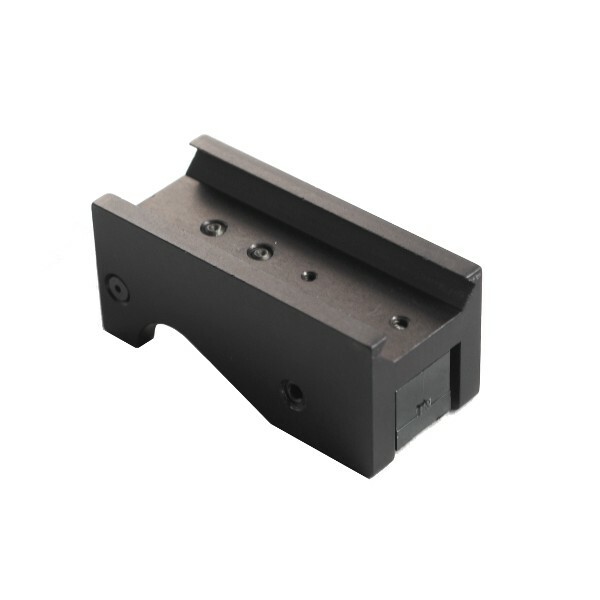 The body itself is a single piece of black anodized aluminum with an integrated Picatinny/Weaver slot. 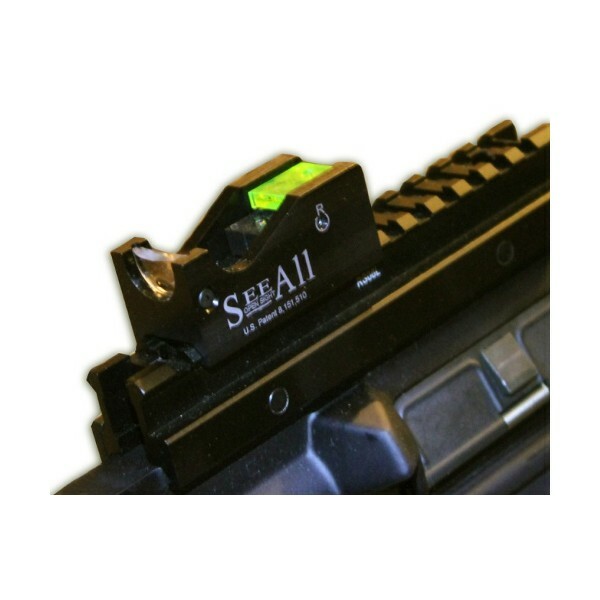 Slide the sight on to the rail of your rifle/pistol/airgun, tighten the two mounting screws at your desired position on the rail, and you're mounted. Surprisingly few parts, which is a good thing - less parts means less possibility of malfunction in the crucial moment. If you're one of those guys who is concerned with your battle rifle's weight, we have some good news. The total weight of the See All Open Sight on our scale was less than 1.8 ounces. And at 2" x 1" x 1" (57 x 25 x 25mm), the sight takes up only two inches of Picatinny rail space. 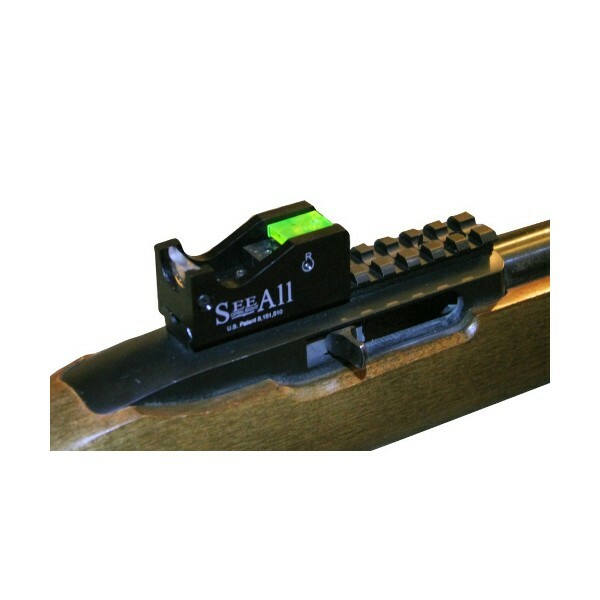 If space is at a premium, you could hypothetically mount this sight using only three Picatinny rail slots (on a riser or at the front/rear of your rail). 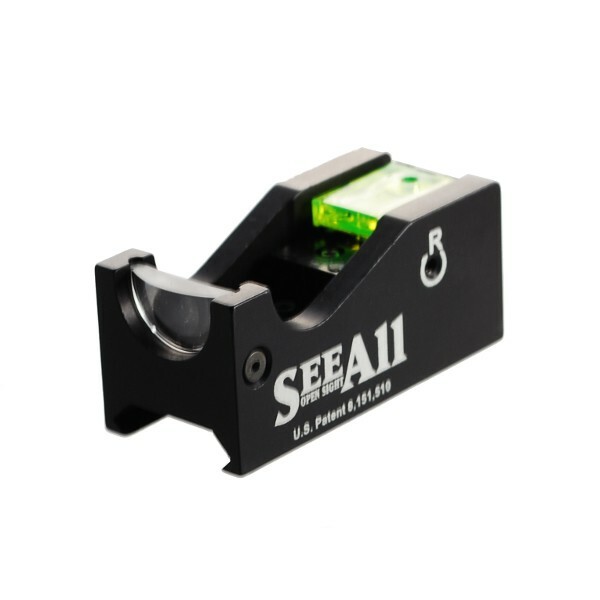 We can see how this would be a valuable addition to a rifle setup with a primary scope and quick-detach rings. No electronics means no possibility of water damage. Drop the sight in a bucket of water for a week, take it out, mount it wet, and shoot it. There's nothing to break. 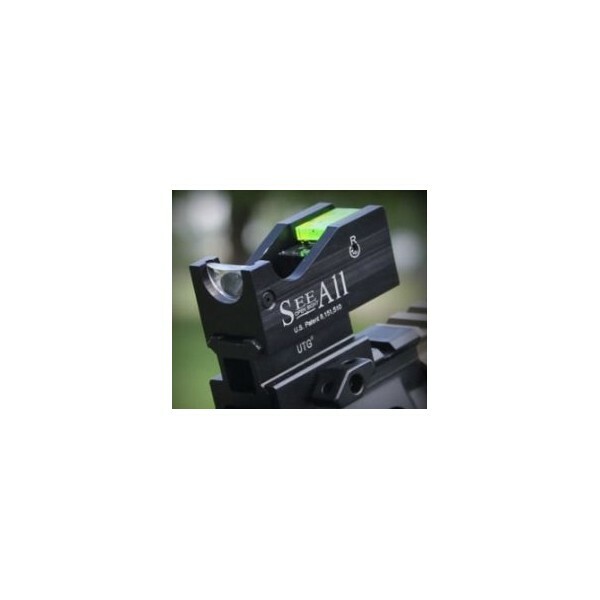 This is the perfect backup sight for your scary black rifle. There are technically two lens elements on this sight. 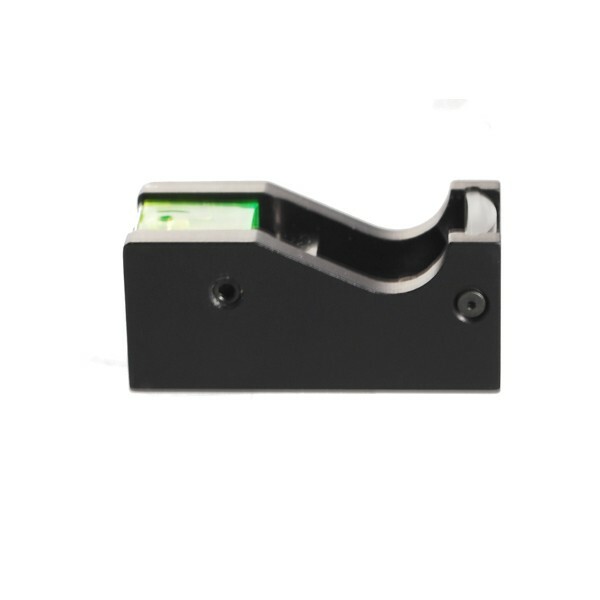 The first, which is closest to the eye when mounted, appears to be a single piece of polycarbonate, polished in a convex shape to magnify the second element, which is the neon green "light pipe" on the front of the sight. Here's how it works. 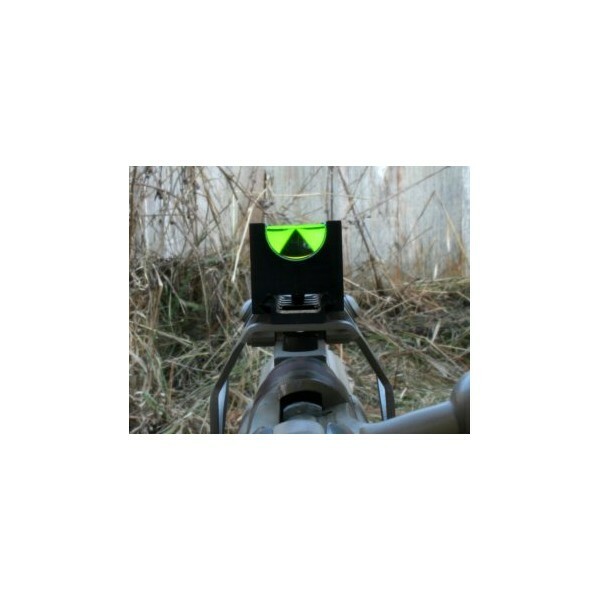 The neon green fiber optic pipe has an ultra-tiny triangle reticle under a horizontal line printed on the side that faces the lens. The lens then magnifies that image so it appears much larger to your shooting eye. Keep both eyes open, put the top point of the triangle on the target (make sure you can't see the horizontal line), and pull the trigger. Could not be any more simple than that. You don't actually have to focus on the reticle, either. Due to the way the See All Open Sight is constructed, the reticle stays in focus while your eye naturally stays on the target and keeps that in focus instead. This is what leads to the ultra-fast target acquisition. Does the See All Open Sight work at night? Yes. You'll easily lose sight of your target long before the sight fails to meet expectations. Every once in a while, a product comes along that really impresses us. This is one of those times. The See All Open Sight does what it does without trying to do too much, and it does it well - at a price that everybody can agree with. This is another one of those diamonds in the rough that we will stand behind 100%. The See All Open Sight is Made in the USA and protected by the See All Open Sight Limited Lifetime Warranty. 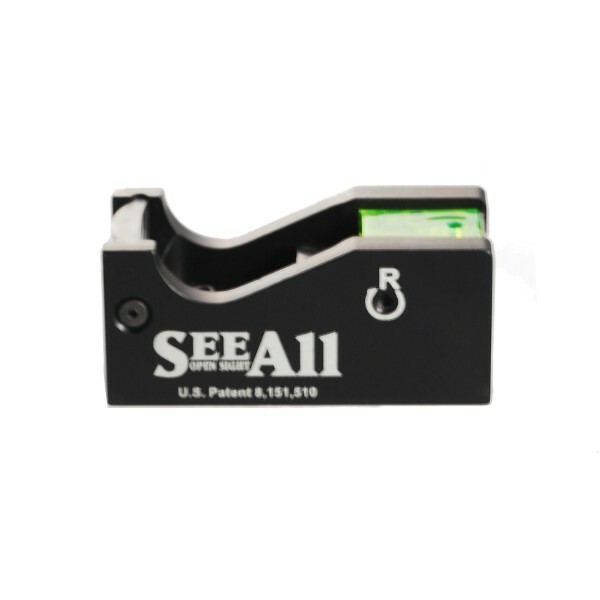 The See All Open Sight is the first of its kind in open-sight shooting technology. 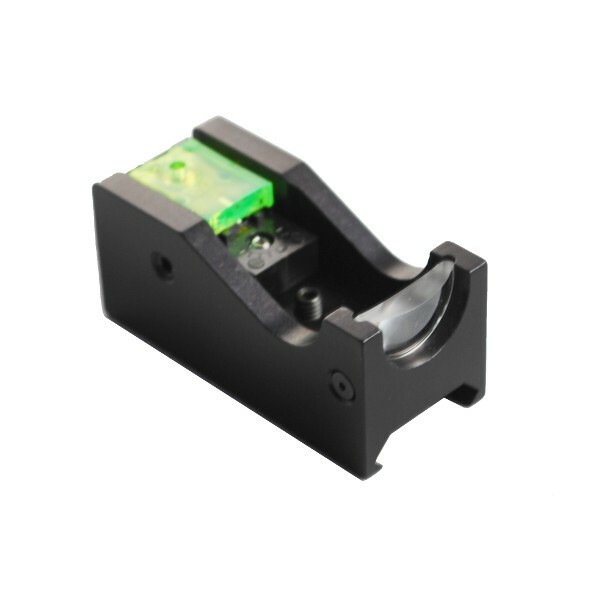 It’s the only open sight that allows the shooter to see both the target and the sight element in perfect focus, simultaneously -- a clear upgrade from iron sights. It’s the perfect sight for any application where magnification isn’t needed: short-range rifles, shotguns, black-powder guns, and even pistols. And the incorporation of edge-glow material means low-light situations are no obstacle. I own 3 See All Open Sights. They are fast, light, easy-to-use, & accurate. They are also handy as heck because they are non-powered [nothing to turn-on, or replace]. I have one on a Ruger 10/22 that shoots 1/2" groups at 50 feet. I have one on an AR sighted-in at 100 yards that is my "go to" gun. I also have one on a Kel Tec KSG 12 gauge. That one is sighted-in for slugs at 25 yards...but it puts 00 buck & birdshot at the same aiming point. I even shot 18 of 25 clays with it this past weekend! The sight is small & the guns carry well in a compact bags, and are instantaneously ready-to-use. Good solid, simple sight for a reasonable price. You won't be disappointed. I own 3 of these [See All Open Sights]. They are mounted on an AR in .223, a Ruger 10/22 TakeDown model, and a Kel Tec KSG. I chose the sight because it is unpowered, very compact, and fits the guns into a smaller carry bag [for each gun]. But, amazingly, they work GREAT. On the 10/22 the 50 foot groups are actually smaller than using the previous scope...on the AR there is nothing to 'turn-on'...just throw-it-up and it's ready to go. On the KSG I have it sighted-in for slugs at 25 yards and find buckshot & birdshot are grouped nicely at the same aiming point [top of the triangle]. Last weekend we threw some clay birds & I was breaking them in fashion using the See All! [18 of 25 thrown - not bad for a bullpup!] Great sight...for a Great price...& no batteries, etc. Give it a try. Also - one of my sights had a bad elevation adj. screw & See All & Optics Camp bent-over-backwards to replace the sight. GREAT customer service. I ordered this sight and mounted it on my .357. What a difference it made. 2" groups at 100 yds. As my eyesight is getting worse with age, this sight is the ticket for me. I rate it right up there with my hologram and red dot sights, WITH OUT BATTERIES, nor the lighting problems associated with bright days. I am going to contact Idaho Fish and Game about using this sight on my muzzleloader. They should accept this sight as being legal, as it is open sighted, no electronics, and no magnification of field of view, I do wish that the grind on the glass wasn't so extreme, so that when you hold it farther away it didn't magnify quit so much. Thanks for developing this sight.